In an industry where downtime can cost hundreds of dollars a minute, having access to real time data on system performance and maintenance is critical. Monitoring, combined with customizable alerts gives you the necessary tools to track problem areas and make efficient cost saving decisions in any sawmill. Aretas Sensor Networks works closely with lumber industry professionals to create customized wireless monitoring solutions. Our wireless sensor networks enable you and your team access to decision making data and alert system whether you are on-site or from anywhere in the world 24/7. We offer a wide array of monitoring solutions such as energy savings temperature & RH, gases such as CO, NO2 and VOC and these saw mill monitoring solutions. Don’t see the solution you were looking for? Ask us today about creating a custom solution just for your sawmill. Utilizing our 4-20 mA technology, we can also integrate your existing pressure sensors or any other 4-20 mA capable sensors enabling data collection into one central system for data analytics. 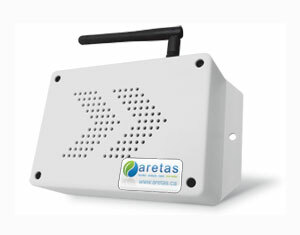 Using the Aretas system, you can set alerts, strategies, thresholds, view historical data and watch numerous locations and monitors at once.